For my second sampling of Richmond’s veggie burgers, I picked Joe’s Inn because a couple reviews on Yelp claimed it serves the ”best veggie burger in Richmond”. How could I pass that up? It was dinner time when I arrived, and judging by the number of people crowding into the restaurant while I was there, it must be a popular place. 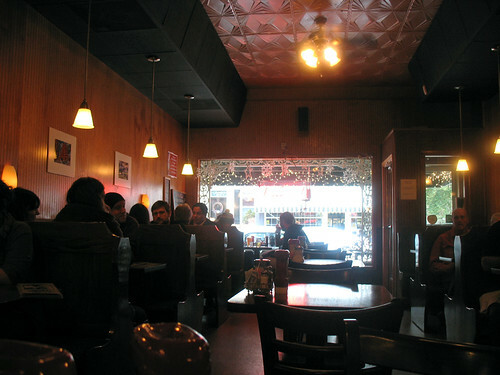 Not modern or overly “hip”, but cozy and comfortable and it seemed to draw customers of all ages, from elderly couples to groups of students. And they were playing Radiohead on the sound system, which is always a plus for me. I ordered the veggie burger and a glass of sweet tea (you can’t pass up sweet tea when you’re in the south, right?). My waitress told me that she thought the veggie burger was very good too, and confirmed that the patty is vegan although she said she was not 100% sure if the bun was. “It might contain whey,” she warned. 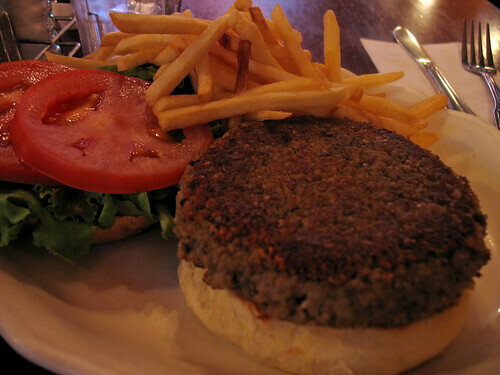 The menu lists the ingredients in the homemade burger: “Bulgur wheat, lentils, mushrooms, onions, leeks, celery, garlic, and cashews”. Yum! I was quite impressed by that list. 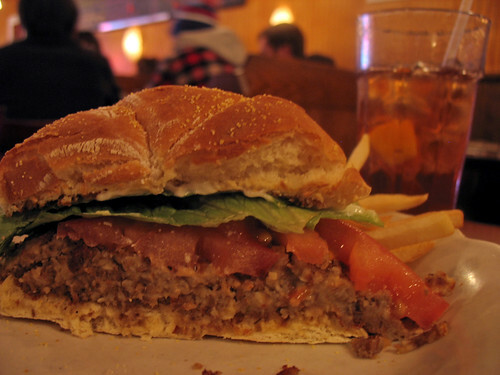 And they did not disappoint – the patty was rich and nutty, and tasted almost sweet. It was soft and mushy, a bit softer than I normally prefer in burgers but the texture was hearty enough to make up for that. Quite impressive for a handmade burger, I can see why so many people raved about it in reviews. My only complaint would be that it could really use a kick of something – a little spice or something tangy perhaps. The texture and the ingredients used are great, but it's just missing that little extra flavor that would make it really amazing. It came topped with lettuce, tomatoes, and mayo (so even if the bun was vegan, you’d have to make sure to order it without the mayo!). Maybe a spicy mayo would have given the whole thing the kick that it lacked, or some pickled onions. The bun was pretty good, above average but not stunning. The skinny fries that I chose as my side (other choices were coleslaw or potato salad) were good but the burger filled me up so much that I couldn’t eat even half of them. I am very disappointed that you left fries behind, but I'll forgive it because you used part of your stomach capacity for incredible sweet tea! I'll finish those fries for you! 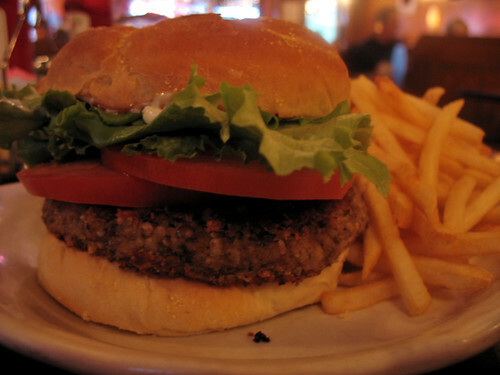 As for the burger, looks delish. And yes, sweet tea in the South is a must! We have sweet tea running through our veins down here. Food was wonderful, but the service was very poor. A very odd experience from start to finish with various personnel. Had the blackened chicken alfredo and it was awesome. Great place to grab a delicious meal if you don't mind waiting longer than you should.